Are Brown Eggs Healthier Than White Eggs? When it comes to purchasing eggs, many people think that brown eggs are healthier than white eggs. But is this really true? We’re here to let you know – the color on the outside truly doesn’t matter! 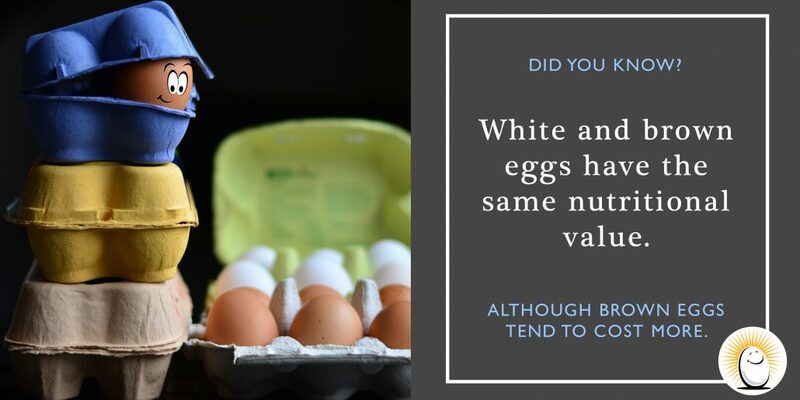 White and brown eggs have the same nutritional value. The color of the egg shell is actually determined by the breed of chicken that lays the egg. White eggs are laid by white-feathered chickens with white or light colored earlobes while brown eggs are laid by brown-feathered chickens with red earlobes. So why do brown eggs cost more? Brown eggs are typically laid by larger breeds. Therefore, they eat more and, ultimately, the egg costs more to produce. Next time you’re grabbing a carton of eggs, make sure you’re more concerned about the quality of chicken it comes from versus the shell color. One large egg contains six grams of high-quality protein plus varying amounts of 13 essential vitamins and minerals, including Vitamin D, Riboflavin, Selenium, Choline and Lutein. Did you know – Eggs are one of the only foods that naturally contain Vitamin D? © Copyright 2019 – Rosemary Farm. All Rights Reserved. Struggling to Peel Hard-Boiled Eggs? Don’t Toss Those Egg Yolks!